Faida is a Nord food vendor and the innkeeper of the Four Shields Tavern in the small village of Dragon Bridge. She stays behind the inn's counter all day. During the related quest, she will direct you towards the Imperial Courier. Faida wears a set of farm clothes along with some gloves and a pair of boots. She wields an iron dagger and carries some common items and gold. Faida will introduce herself briefly when you approach her: "Faida's the name. I keep the inn." She doesn't seem to trust strangers too much, as she may tell you: "Something different about you, I can tell. Hope you ain't here to cause trouble." 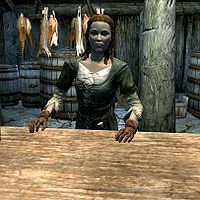 Although she may not entirely trust you, Faida will tell you about the food she has for sale: "The meals I serve ain't what I'd call a Jarl's feast, but they'll fill your belly." She may also point out the increasing number of soldiers due to the civil war: "Seen a lot of travelers lately. Mostly soldier, nowadays." Faida will also talk about some of the families in Dragon Bridge. She will ask you if you have met the Lylvieves: "You met the Lylvieves? Quiet family, but they're the heart of Dragon Bridge." As long as no member of Horgeir's house is around, she may provide you with some gossip about Horgeir's wife, Olda: "Poor Horgeir. Everyone in town knows about his wife's affair but him. Probably better if he doesn't know." She will also provide you with her opinion as to why dragons have appeared in Skyrim: "I think the dragons are here to test us, and make sure we're still true Nords." Faida may also reveal to you that she used to work at the Winking Skeever in Solitude: "I was a barmaid at the Winking Skeever when I met my husband, rest his soul. Wasn't for him, I'd still be working there!" You can also ask her where you can learn more about magic. She will direct you to either the College of Winterhold or the court wizard of Solitude, Sybille Stentor: "Nords don't care much for magic. The College in Winterhold is about the only place it's not looked down on. Otherwise you could talk to the Jarl's pet wizard in Solitude." Gaius: "Oh, Faida. I may travel alone, but you know I carry you always in my heart. I'll see you soon." She seems to be the cousin of Corpulus Vinius, as stated by the game's files. This page was last modified on 24 July 2016, at 00:19.